There is an appeal that is unique to Italy and its internationally acclaimed meals. Some travelers get the chance to experience the wonders of this country teeming with culture and history firsthand. You don’t have to board a plane and go out of the country just to have a taste of Italy. All you have to do is visit an Italian restaurant in Oshkosh. Benvenuto's Italian Grill has been a go-to restaurant for people of all ages in Wisconsin. All of our locations, including our Italian restaurant in Oshkosh, consistently meet the expectations of customers. With us, you can have your share of quality and appetizing Italian meals any day. 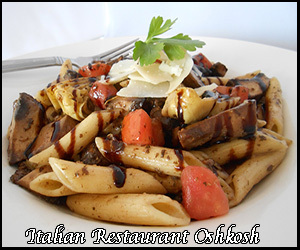 Our Italian restaurant in Oshkosh accommodates customers with special diets and food restrictions. An Italian restaurant in Oshkosh is expected to do justice to the traditional cuisines of the old country. However, some people have allergic reactions or are prohibited from eating a certain food. Our Italian restaurant in Oshkosh understands these health concerns. The menu at our Italian restaurant in Oshkosh features gluten-free as well as low-gluten options. Additionally, we offer low-carb and meatless dishes. We do this to ensure that anyone can enjoy the meals we serve at our Italian restaurant in Oshkosh. Dietary restrictions and other health issues should not keep you from devouring sumptuous meals. At our Italian restaurant in Oshkosh, you can eat to your heart's content guilt free! Our Italian restaurant in Oshkosh serves dishes made from fresh and local produce. Benvenuto's Italian Grill is a locally owned and operated Italian restaurant in Oshkosh. Supporting local vendors by buying their products is one of our priorities at our Italian restaurant in Oshkosh. We use all-natural ingredients sourced from Wisconsin as much as possible. Aside from using fresh and high-quality ingredients, our Italian restaurant in Oshkosh also avoids additives or preservatives whenever possible. With the help of local businesses, our Italian restaurant in Oshkosh will never fail to serve you with quality and mouthwatering meals all the time. We guarantee you a feast of flavors when you visit our Italian restaurant in Oshkosh. Drop by any day to have a taste of our freshly made dishes. Our Italian restaurant in Oshkosh is the perfect place to bond with loved ones. Over the years, countless guests have dined and had a good time at our Italian restaurant in Oshkosh. Our frequent customers include couples on a date. With a gorgeous fireplace, cozy setting, and warm ambiance, our Italian restaurant in Oshkosh truly sets a romantic mood. Our Italian restaurant in Oshkosh is also the perfect place to hang out with your friends and family. If you prefer a more exclusive area, we can arrange for your group to stay in the private dining room of our Italian restaurant in Oshkosh. Many beautiful memories have been made at our Italian restaurant in Oshkosh. Why not make some of your own with those who are dearest to you? Spend an unforgettable day with your loved ones at our restaurant today! Are you looking forward to dining at our Italian restaurant in Oshkosh? Benvenuto's Italian Grill is open from 11:00 AM to 10:00 PM every day. For inquiries, please get in touch with our staff. We look forward to serving you! Click here to learn more about our Oshkosh location. At Benvenuto’s Italian Grill, we offer a diverse selection of traditional Italian dishes. Some of our house specialties include our hand-stretched, wood-fired pizza, our daily fried fish, and our fresh salads and sides. To ensure that our guests never run out of new dishes to try, our featured menu rotates seasonally, changing four times per year. Try our famous meatballs topped with marinara sauce or our signature Italian salad!